Hi! I would like to ask you a question first. Can you guess what these cubes are for? 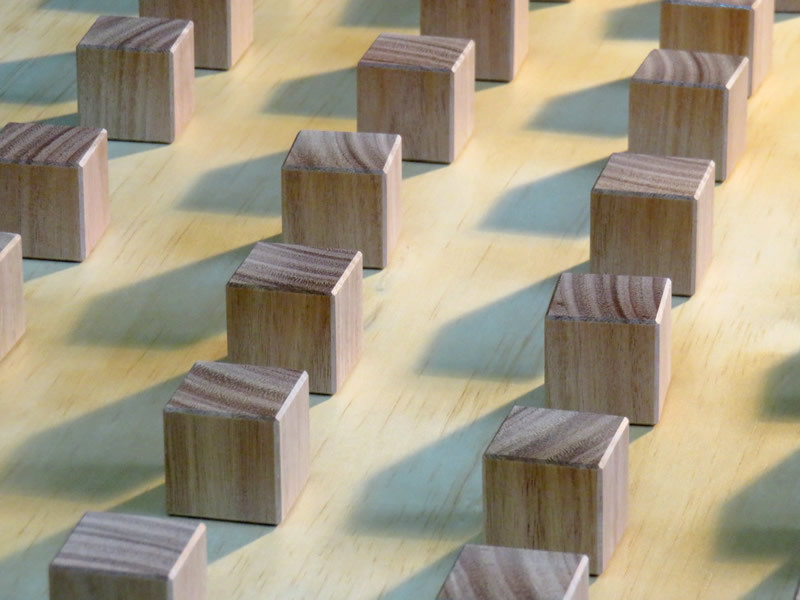 These cubes are not puzzles, these are a part of Juno's new puzzle. His new puzzle is "Windmill Burr #2." 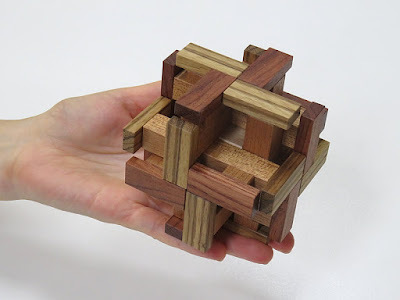 The reason that there is "#2" at the end is because he designed "Windmill Burr" which was released by Mr Puzzle as a Limited Edition in 2010 (It's out of stock now). Well, I think that there may have been some room for better consideration naming puzzles, anyway he decided to call it Windmill Burr #2. The method of deciding this name was very simple but it's not so simple to solve. Windmill Burr #2 is composed of 12 pieces and a cube. It may be complicated to solve therefore we will supply the solution by Burr Tools (computer program for interlocking burr puzzle) file format. 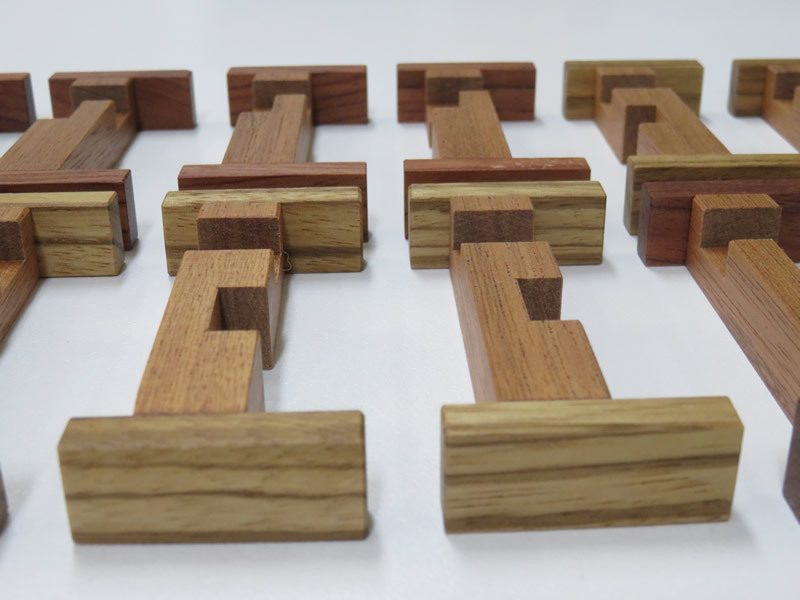 The puzzle size is just a good size to hold with the hands and I think you can enjoy playing it comfortably. 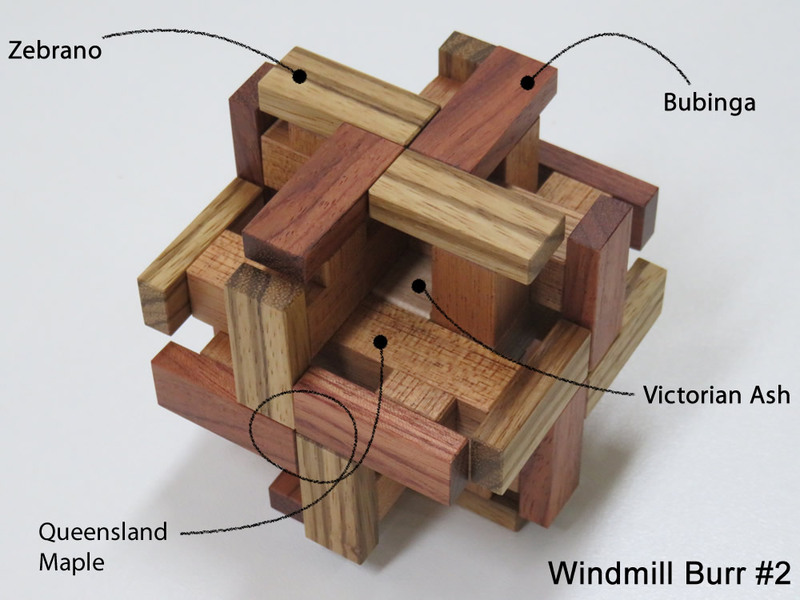 Windmill Burr #2 is made from four kinds of timber. The part which stands out the most is the windmill part, and two timbers are used here; Zebrano and Bubinga (See the picture below). The inside structure is made from Queensland Maple, and the cube is made from Victorian Ash. Juno used Silver Ash for Reza 6-8. Silver Ash and Victorian Ash sound like the same kind of timber, don't you think? Actually, these two are not from the same family. Silver Ash and Victorian Ash both have the word "Ash" in the names but they are different species of European Ash as well. It's complicated, isn't it? There's one more complicated thing. Queensland Maple is used for the burr pieces. Well, I think you have already noticed, yes Queensland Maple is not Maple, it's from the family of Rutaceae. I don't know why some Australian timber names have similar names to foreign timber. Oops, this blog is not for plant lovers, let's finish talking botany here. Juno and I hope that puzzle lovers will enjoy Windmill Burr #2.